This smart interactive learning tool can be used to create any chosen environment, in high fidelity and at the touch of a button or gesture. High quality video and audio are combined with interactive surfaces and gesture control. Individual scenes can be further enhanced by adding scents and other effects, such as wind, smoke and colored LED lighting. From the Control room can be listened to what is said in the training room, the instructor can provide information through the speakers, can the pop appeal to you by means of A Bluetooth connection and speaker and a lotus, victim information can be passed through an “ear”. All image and sound can also be recorded for retrospective viewing. You will have full control over the simulation with an easy to use interface. A simple template allows you to customize scenes and exercises. Video content can be customized to include 360 video, interactive panoramas, 3D graphics, games and exercises. This exciting new way of providing simulation to all students, clients and colleagues uses video projection onto walls, with the ability to change all environments by a facilitator at the click of a mouse. 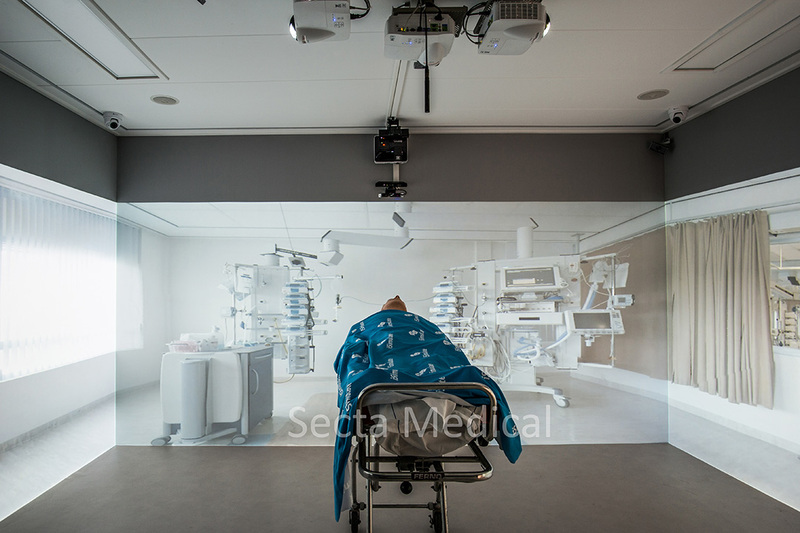 An example medical scenario would be to change the room to match the student on a journey from a roadside accident or home setting, to an ambulance, to an emergency department or resuscitation bay, to the operating theatre, and onto the Intensive Care unit or ward setting. The educational reasons for changing environments to match real world settings are very sound, and we have UK Medical Institutions (Universities) now using the technology to teach their students. For the medical market, we can import iSimulate directly into scenarios, use live voting and evidence base features, and also use the touch sensitive nature of the walls to create learning experiences. In a corporate setting, the Immersive Classroom can be used for a multitude of purposes such as decision making exercises, product launches and virtual brand engagement.